Get a crusty loaf of bread ready! 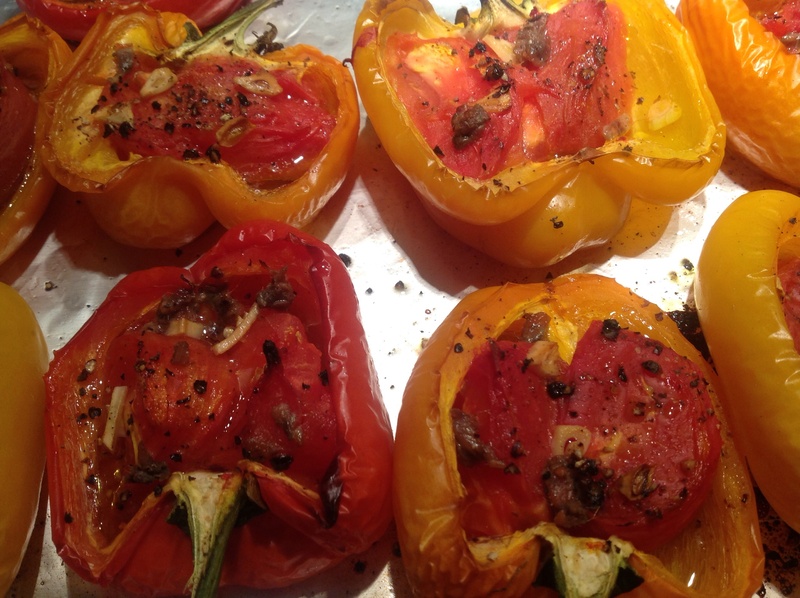 You are going to want to sop up every last drop of the sublime juices of these stuffed peppers. 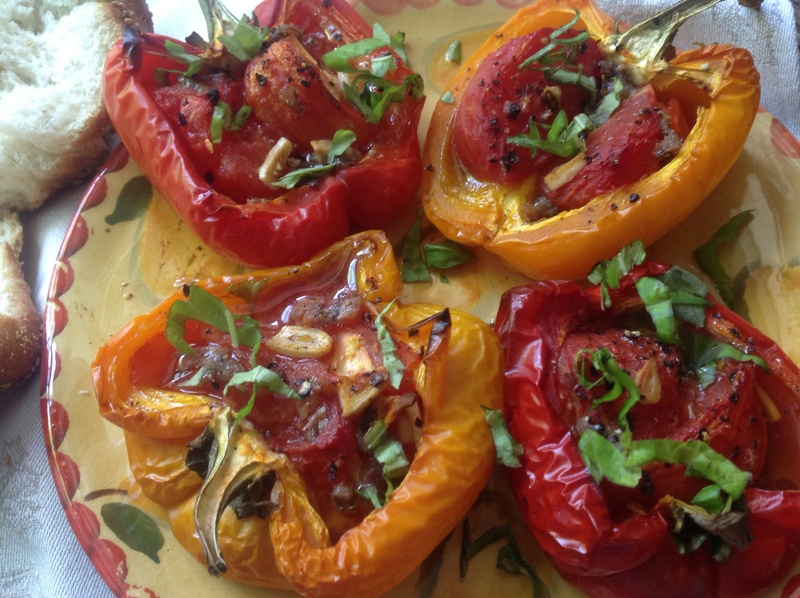 With both peppers and tomatoes in season this is a perfect recipe to showcase the season’s stars. This recipe comes to me from the brilliant British chef Delia Smith via my dear friend Claire, but is originally from Piedmont, Italy. You will wonder how something so simple could taste sooooo good. Although there are anchovies in the recipe, don’t shy away from them if you are not a lover of this salty fish. You won’t even know they are there once the peppers are cooked down and they will add a complex briny note to the juices. Did I mentioned to have bread ready? 1- Cut the peppers in half, seed, being careful to cut through stem also so you leave the stem on. Place on a foil-lined sheet that is lightly oiled. 2- Place 3 tomato segments in each pepper half. 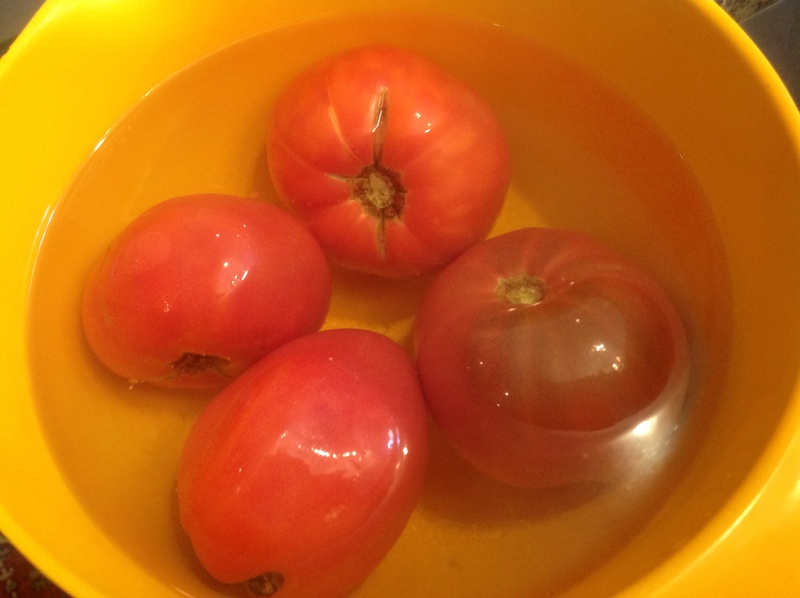 (To peel the tomatoes, place in a bowl, cover with boiling water for 1 minute. Drain. The peel will slide right off with your hands.) I used heirloom tomatoes. To save time, you can use peeled plum tomatoes in a can. 3- Slice one anchovy fillet per pepper and sprinkle over the tomatoes. Divide the garlic evenly among the peppers. Drizzle 1 tsp of olive oil per pepper half. Season with fresh ground pepper, to taste. 4- Bake at 350F for an hour. Before serving, sprinkle with the fresh basil. Serve warm with that crusty bread. Simply delicious! Can be served as an appetizer or as a vegetable side dish. Enjoy! 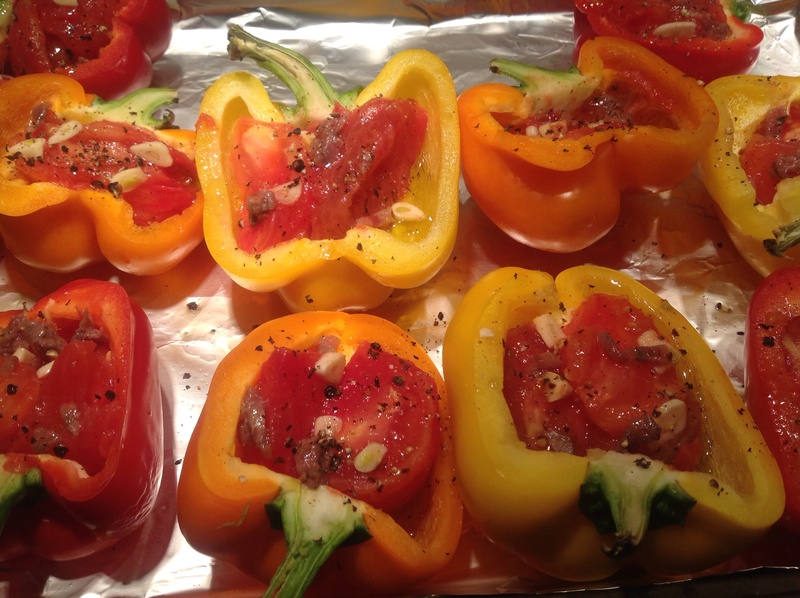 This entry was posted in Recipes and tagged Dehlia Smith's stuffed peppers, peppers, stuffed peppers, tomatoes by Johanne Lamarche. Bookmark the permalink. These stuffed peppers were always a part of my grandparents’ Christmas Eve fish dinner! Grandpa used his home canned garden tomatoes in winter. We also use them during summer months with the fresh tomatoes. The salty anchovies just intensify the sweetness of the tomatoes. Sometimes I sprinkle some toasted Italian bread crumbs and just little chopped Italian parsley on top. I could make a meal out of them! For appetizers I use the mini peppers available in bags. It put a smile on my face when I saw this post because I thought of my dear grandpa who had a very productive Victory Garden behind his Brooklyn, New York, home during WW II. I want you to know how much I look forward to seeing your posts come across my e-mails! Oh Mary Ann! You made my day!!!! I hope othercreaders will read your comments. What a womderful story to share. You inherited your grandfather’s green thumb. I would love to see his picture sometime. When you use the smaller peppers, how do you get a tomato in there? I have just roasted those smaller peppers whole. Was your family from the Piedmont region of Italy? My family immigrated from Sicily in the early 1900s. My dad arrived when he was just four years old in 1914. Sicilian cooking uses a lot of peppers, tomatoes and eggplant because of the sunny summer weather. Basilico is added to almost everything in the summertime because of its sweet flavor. The foods I grew up with are very similar to those found in Provence, France, in fact many are identical. 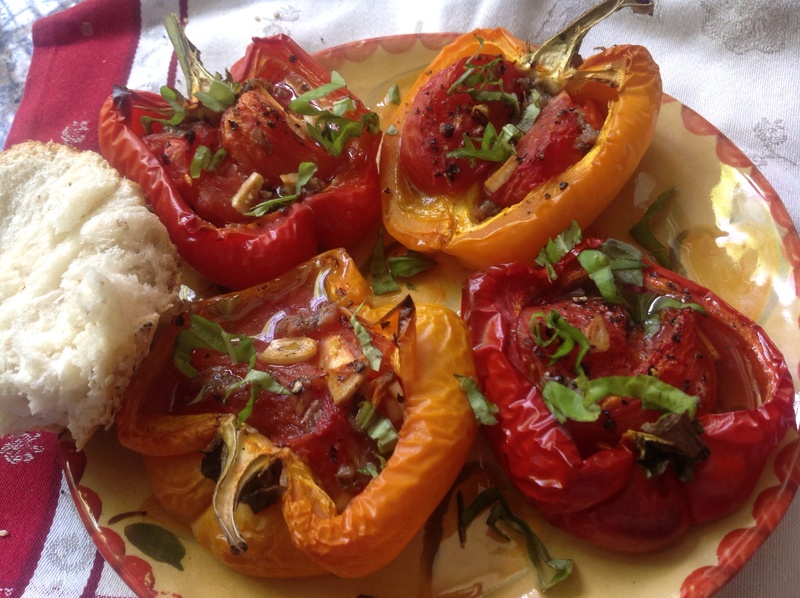 When I use the mini peppers I choose the larger ones and just roast the others. I do cut them in half first but I am careful to be sure that they will lie flat. 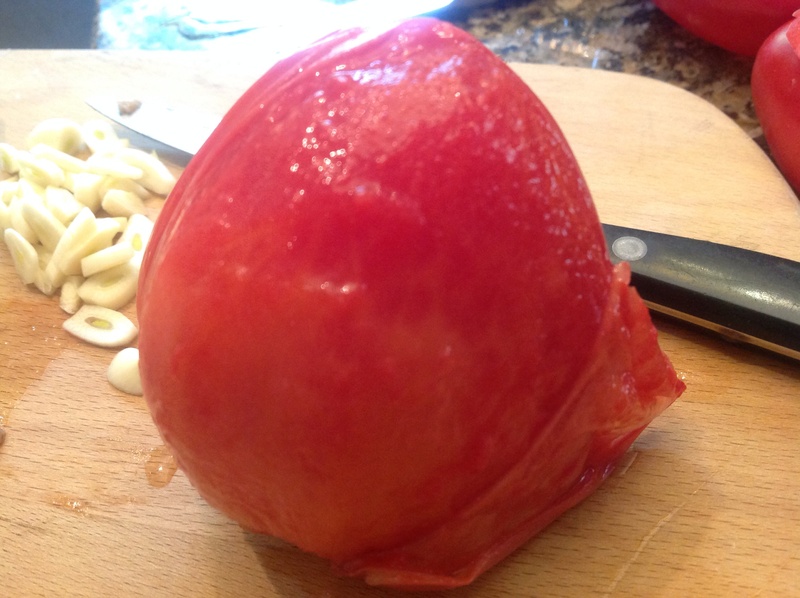 I peel and seed the Roma tomatoes and cut them in small dice. I also mince the anchovies. Many people shy away from anchovies but they are actually mashed until they almost dissolve and are “hidden” in many Italian and Provençal dishes. They add great flavor! Your photography of the food is outstanding! Makes you want to just dig in and enjoy the delicious juices with a piece of fresh Italian bread! I can learn so much from you Mary Ann! Love these stories of your family. I’d love to have you as a guest chef in a future post! I can come and learn while photographing your masterpiece. Something for fall could be fun. Let me know! YOU should have a blog, my talented friend! I’ve made this recipe, which I got from an English friend, for many years now. It’s interesting that those people who don’t like anchovies have no idea that they are eating them since they disintegrate in the baking. Everyone loves this recipe. I know! That’s why I prefaced the recipe with the disclaimer against anchovy haters. Plus anchovies provide good fat and a good dose of calcium. In this recipe, they are perfect! I’m so happy to have you read and omment, Sigird! Thank you! A suggestion: It would be both ink and paper saving if the recipe could be summarized for ease of printing on one page. Seeing the finished product is great on computer but costly to print. Hope that is possible — enjoy all the ideas you share. Thanks! Thank you for the comment. It is a common problem with bloggers. How I have it set up is you can delete pictures you don’t want before printing the blog post, from the button at the end. I am continuing to work on my technical skills to facilitate this process. I have the very same complaint!!! Appreciate your taking the time to let me know. I’m one of those who would have certainly shied away from the anchovies, so I’m glad you put that extra part in there! The recipe sounds tasty and looks absolutely fabulous!!! I think my Mom would really like these! I just copy and paste the written part of the recipes into Word and save them onto my computer. Very easy to do, no pictures, and they print up with just what I’ve copied and pasted. Thanks for that helpful suggestion Alycia! Technology is not my strongest suit! Twitter anyone? I hope you trust me on the anchovies and make this for your mom. I am sure she will love them! Let me know how they turn out. Thanks for reading and your valuable feedback. I do trust you on the anchovies! What a beautiful dish, and clever in how the peppers and tomatoes are combined. Trust me!!! 🙂 Let me know if you try it out, Nancy. It won’t disappoint. I checked out Adri Barr Crocetti’s site on your recommendation today. Beautiful photography, interesting recipes and lovely writing. He has a new fan. I will hunt for the agrumato olive oil now… Thank you for reading my blog! Thank you! It was the first time I tried sanding sugar and couldn’t believe it stuck with just a bit of water!! A true French classic that has stood the test of time!! Wonderful reminder – so thank you. There is a very easy way to write out the recipe segment of your post so that it is printable without the photos etc. Go to Support and search for recipe short code. Try it out with a trial post first just to make sure that you get the hang of it and that you can see how it works. It’s very easy and doesn’t cost anything – yay!! I will put the link in my next comment to avoid getting this one go to spam comments. If you need help, email me at selmastable at gmail dot com and I will send you you the layouts and instructions. And please remember to add Angie’s post etc to this one to be considered for a feature!! Gorgeous recipe Johanne, and do you know I craved anchovies when I was pregnant? Not very good at that time I know, but I do so love anchovies. I have to try this. I wondered what it would be like if I threw in cherry tomatoes in the peppers? It would be hard to peel I know and very fiddly, so perhaps not? I see you were having issues with the print feature? Have you resolved it yet? Our dear Selma also helped me with it. It is a shortcode that just embeds your recipe in the post, very cool the way it prints. I can help you with that if you are still having issues? I know there is an easier way to do such a post, Lorwtta. Just could not figure it out. I would love your help! The peppers are fantastic. I would try them with the cherry tomatoes. They would be good but not as good as with the peeled to atoes that end up just almost decomposed inside the pepper and perfect for scooping up with crusty bread. I’ll send you a private message and walk you through it Johanne. No worries.